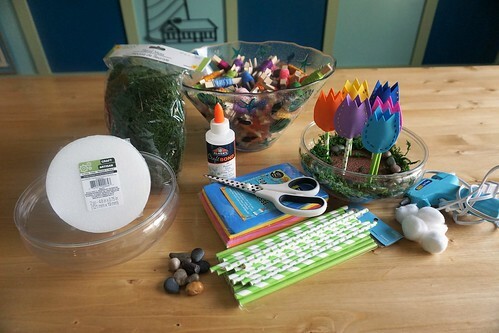 For the month of June this summer I’m hosting weekly mini craft parties, as I call them, for some of my young neighbor girls. Our first craft was today and the girls painted rocks. I wanted their focus to be on Kindness Rocks. 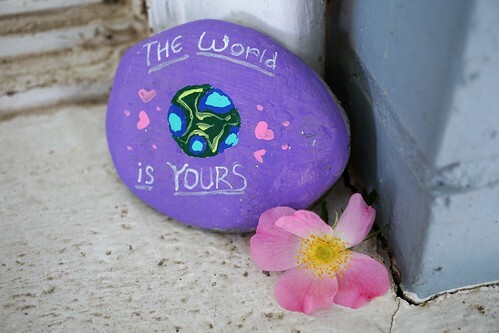 The main idea of kindness rocks is to spread cheer and sunshine through thoughtfully painted rocks. 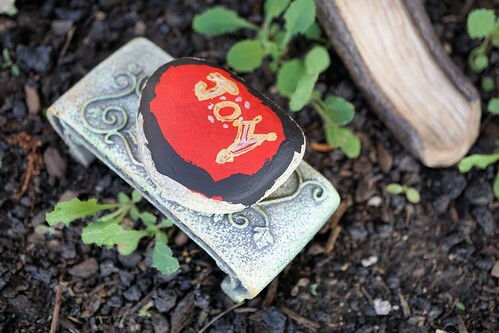 These rocks are painted brightly and often contain a positive affirmation or just one powerful word. And then they are placed around the community- in public places- for anyone to stumble upon. 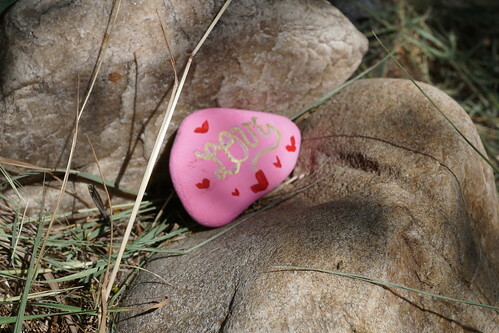 I also told the girls they could paint a rock with a specific person in mind. 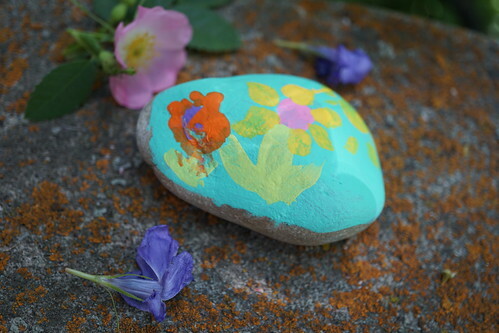 For this craft I gathered clean rocks with a fairly smooth surface on one side, acrylic paints in assorted colors, paint markers for writing (optional), paint brushes in assorted sizes, and a clear sealer to help make the rocks weather resistant. I bought Krylon DIY sealer at Hobby Lobby. 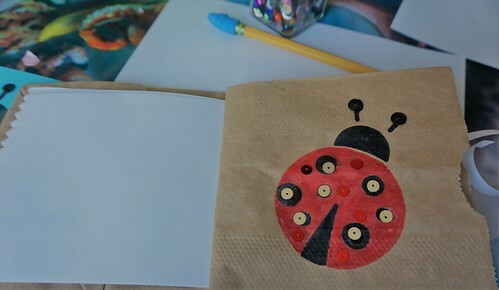 I first prepared my craft room table by covering it with a plastic tablecloth and had paper plates (for the paint) and baby wipes on hand. 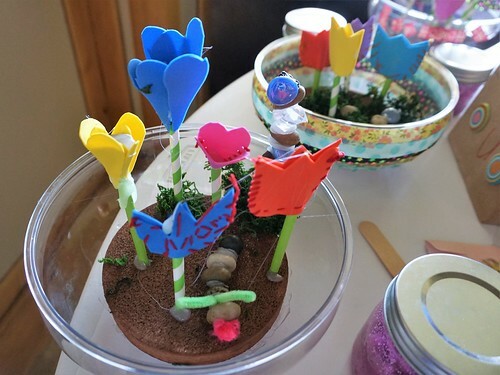 The girls used sponge brushes for the base paint and smaller brushes for the detailing. I had four colors of fine tip paint markers for them to use- gold, silver, white, and black. I bought these at Hobby Lobby also. 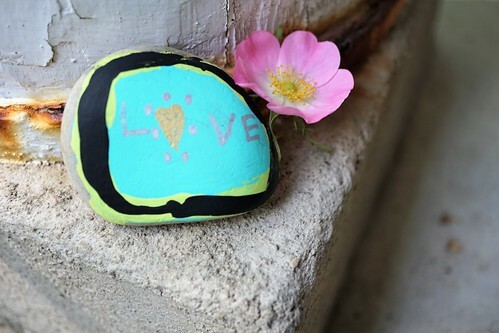 Some like to paint the whole rock, but I think it looks great just to paint one side of a rock and leave the sides and bottom natural. When the rocks were finished, I sprayed them with the sealer (outside) and then we hopped in my car and drove a little ways to a nature park in our neighborhood. 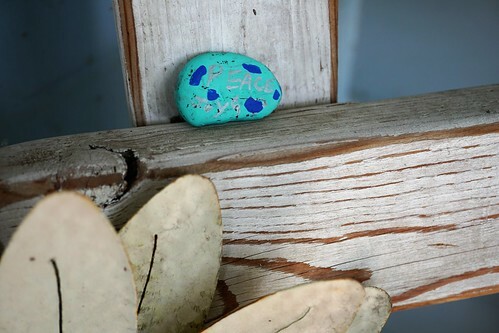 The girls placed some rocks in random spots there, and then we drove to a woman’s home and the girls placed rocks on her porch. This woman is battling cancer and she is a member of our church congregation. The girls thought of her because she had been a leader/teacher to them before she got sick. 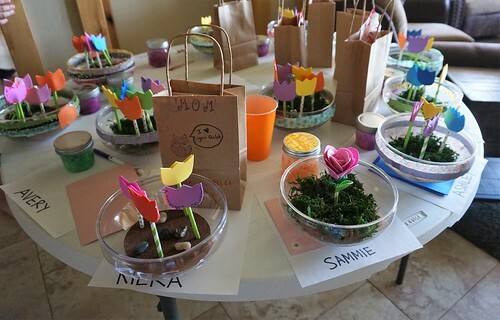 Darcie and I set up three craft stations- tulip gardens were made at my craft table; sugar scrubs were made at the kitchen table; and stamping cards and paper sacks took place at the kitchen island. 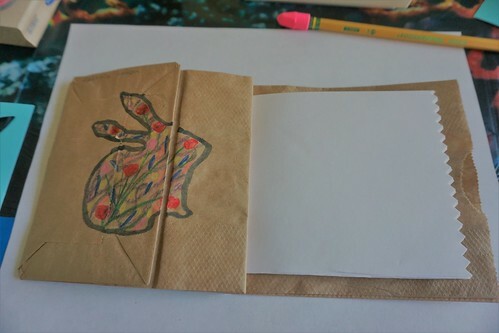 This way, when a girl finished her scrub or tulip garden before the others, she was allowed to stamp and color a card and a paper sack (as a gift bag for the sugar scrub) where she was out of the way and still busy. 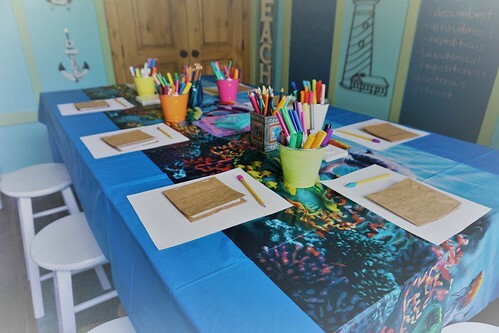 We also set up an extra table for the girls to keep their crafts once they were finished. We taped a sheet of paper with their names on them to the table. 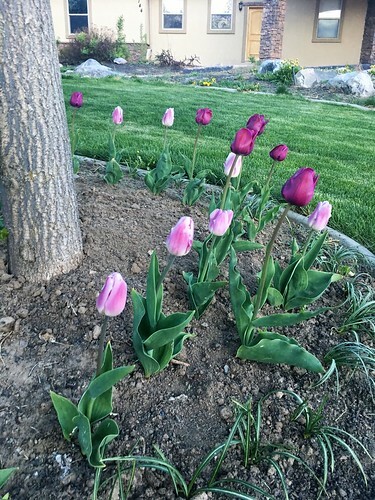 Inspired by the tulips growing in my yard which I planted last fall, I came up with a tulip garden craft which was fairly easy and turned out wonderfully. 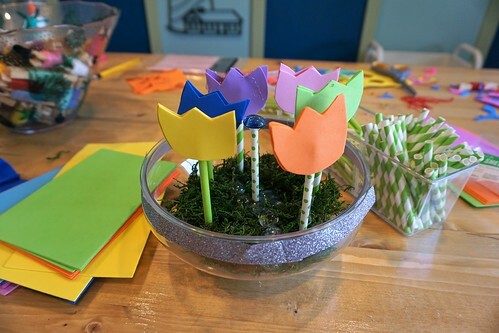 For every tulip, each girl either cut her own tulip design out of the foam or used my pre-cut ones, or a combination of both. 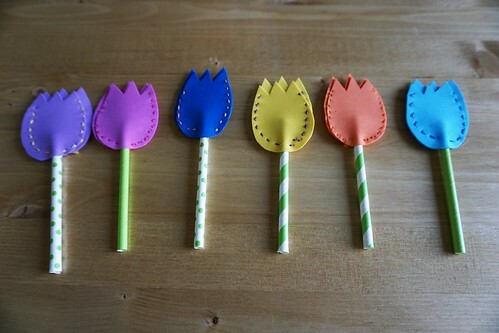 Each basic tulip took two matching parts, one for the front and the other for the back, with the straw-stem glued in between. Then the front was glued to the back, with a little cotton fluff as filler, if desired. 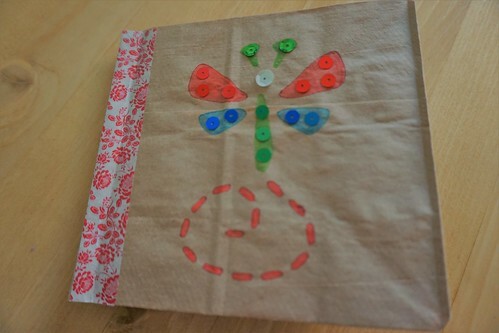 I supervised the girls with the needles and hot glue gun, of course. 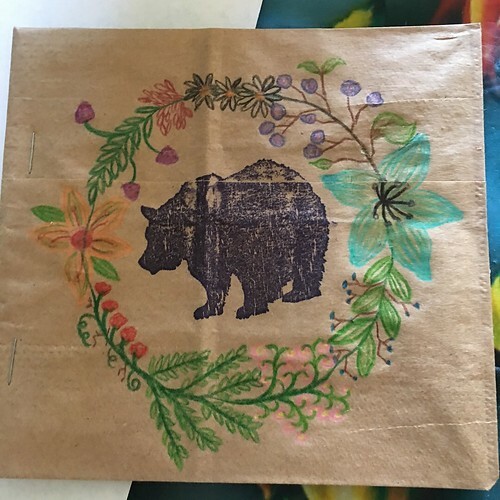 I ended up helping several tie their ends and I tried to show them two different ways to stitch. 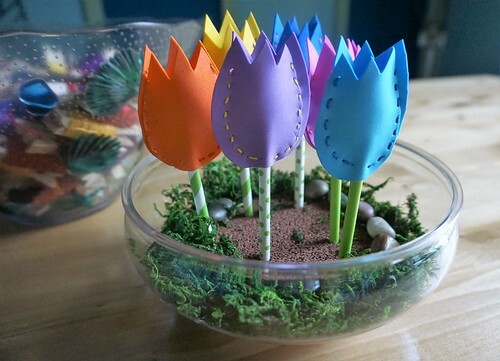 Once the tulips were finished, the girls placed them in the Styrofoam disks and glued down moss and river/glass rocks as desired. One girl made a caterpillar and rock totem. 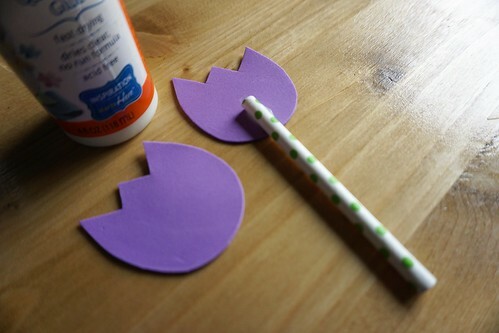 We could’ve added foam leaves, but I didn’t think of that in my prep work and I kind of like the simplicity of the stems alone. 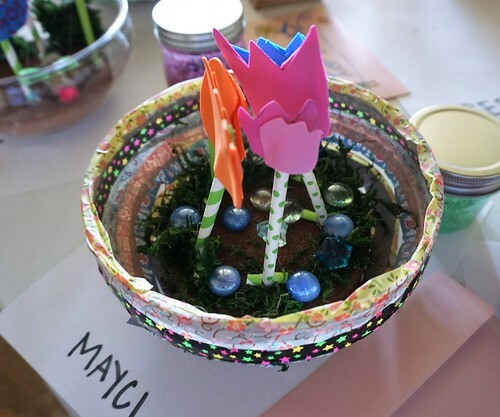 The important thing is that what I gave the girls to do sparked their creativity, which is the goal. 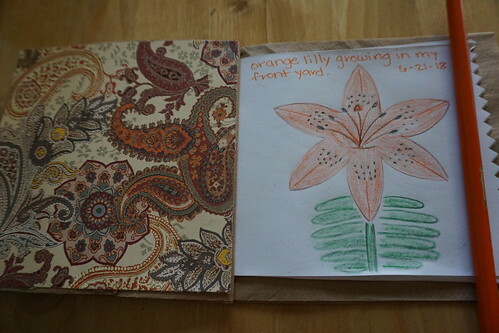 I’ve heard it said that art is more open-ended than craft projects, but I disagree. 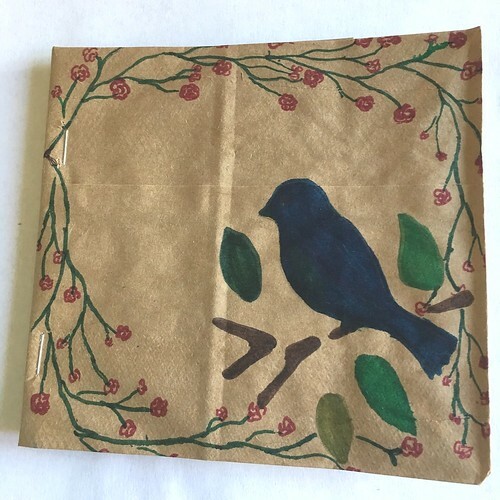 I think crafts can be open-ended, too!